If gorgeous views of Lake Gaston is what you are looking for, you do not want to miss seeing this amazing two-lot lake house located at 228 Waterman Drive in Gasburg, Virginia. Enjoy awesome views from every room of this three-bedroom, three-bathroom home. The house is located on a flat lot on Pea Hill Creek/ Cold Spring Branch in the NE Quad of Lake Gaston. Before we venture inside, we thought you would want to see the huge double boathouse. It is definitely where we would be spending most of our time! Also outside, you will find a 20×30 finished garage/shop that is also heated for those chilly, winter months. As we head inside, you will find a large kitchen that opens up to the living room with beautiful views of the water. Relax in the master bedroom with your own fireplace inside of a gorgeous stone fixture. Ready to Get Your Lake Life Started? Whether you are looking for an investment property, a weekend retreat, or your main residence, I am here to help! I would love to show you around 228 Waterman Drive, and also show you some of the other homes currently available at the lake. 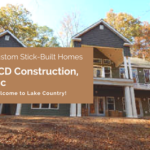 Give me a call at 252-425-4380 to get your Lake Gaston home search started today!